This site is dedicated to the men of alpha battery 1/14 artillery who gave all they had every day supporting our brothers in the bush. Here are a few of the Landing Zones the Gun's of Alpha Battery 1/14 F.A. Visited. This picture was taken at FSB Bayonett West. The guy on the left is Cpl. Melvin Mitchell and myself, Cpl. David Pendergraft. We graduated high school at Jenks, Oklahoma, May 24, 1969.We were buddies when we joined the army in Tulsa, Oklahoma, July 8, 1969. We did our basic training at Ft. Polk, LA and our advanced training at Ft. Sill, OK as Artillery men. We received 18 days leave time after training at Ft. Sill as most of the guys we trained with. We had orders for Viet Nam and arrived in NAM, DEC 5 1969. After a short time in Nam, Melvin and myself were no longer buddies. We had become brothers. We spend nearly our whole army time together. We joined together and were discharged together and are brothers to this day. 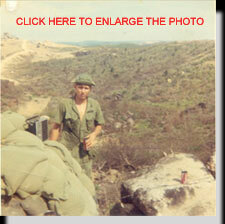 CPL.DAVID PENDERGRAFT I ARRIVED VIET NAM DEC.5 1969 ASIGNED TO 1/14F.A. ALPHA BATTERY AT LZ GATOR GUN 3 WE HAD 4 GUNS THEREAND 4 MORE AT LZ DOTTIE ALPHA BATTERY WAS THE ONLY 1/14 GUN BATTERY TO HAVE 8 GUNS. 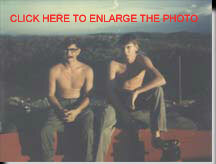 MY FIRST DAY IN ALPHA BATTERY WE WENT ON A JUMP TO LZ SHIRLY IT WAS A SPECIAL FORCES CAMP NOT SURE HOW LONG WE STAYED. THEN BACK AT GATOR WE FIRED LOTS OF CONTACT FIRE MISSIONS FOR THE 198TH INF. AND A FEW MARINE CAP TEAMS WE MADE ONE MORE JUMP FROM GATOR WE WENT TO OP GEORGE WE SET THE GUNS UP OUT SIDE OF A VILLAGE I HAVE FORGOTTEN THE NAME OF VILLAGE BUT THEIR WAS A WATERFALL AT THE OTHER SIDE OF VILL GREAT PLACE FOR A SHOWER THEN BACK ON GATOR WE FOUND OUT WE WERE MOVING FROM GATOR TO A BRAND NEW HILL IT WAS ON THE HILL ABOVE LZ BAYONET THE ENGINEERS DID THE GROUND WORK AND BUILT OUR HOOTCHES AND AMMO DUMP WE WORKED OUR TAILS OFF SANDBAG FILLING FOR THE ROOFS OF OUR HOOCHES AT THAT TIME TOO WE WERE CLEARING BRUSH AND YES WE DID USE THE ORANGE GUYS WE SPRAYED IT FROM HAND PUMP 3 GAL. SPRAYERS RIGHT OUT OF THE BARREL LOOK AT THE PHOTO PAGE AND GO TO THE GUARD BUNKER PICTURE YOU WILL SEE THE BARREL WITH THE ORANGE STRIPE. AFTER BEING ON THE NEW HILL CALLED FSB.BAYONET WEST FOR A FEW MONTHS I WENT OUT TO LZ DOTTIE AND WAS ON GUN 3 THERE ALSO THERE WAS A LOT LESS WORK OUT AT DOTTIE I EXTENDED MY TOUR SO I WOULD BE OUT OF THE ARMY WHEN I GOT BACK TO THE WORLDSO IN JAN OF 1971 I WENT BACK TO FSB.BAYONET WEST AND STAYED THERE TILL FEB.6 1971 AND BACK TO WORLD I CAME I WAS DISCHARGED AT FT.LEWIS WASHINGTON AT THE AGE OF 19 I MARRIED THEN AND HAVE BEEN NOW FOR 30 YEARS I HAVE 2 BOYS AND A GREAT WIFE MY OLDEST SON MADE ONE OF THE FINEST CABINET BUILDER I HAVE SEEN. MY YOUNGEST SON MARRIED AND GAVE US A GREAT DAUGHTER NOW WE HAVE OUR FIRST GRAND CHILD SHE WILL BE 2 APRIL 1 2001 WHAT A GIFT A PROUD PAPA I AM. SO THATS MY STORY AND I AM STICKING TO IT. --LZ Hurricane-- Home of the Vets of 1/82 Field Artillery "Can and Will"